As a Spiritual Alchemist and Mentor, Ronda helps you find the reason why a particular situation keeps repeating itself throughout your life and how to change it through a spiritual understanding of your soul and it’s purpose. Private and confidential, one on one, Soul Solution Sessions, via phone or in person are scheduled for 1 hour increments. Your Prayer Requests are always welcomed and are of course, free of charge. All workshops and appearances will be listed on the Event Calendar as they are scheduled. Tarot Readings: Ronda has been reading tarot intuitively for over 30 years and is available for private readings and public venues, such as restaurants, parties for all occasions and benefits. Private readings are available via email, phone and in person, by appointment only. 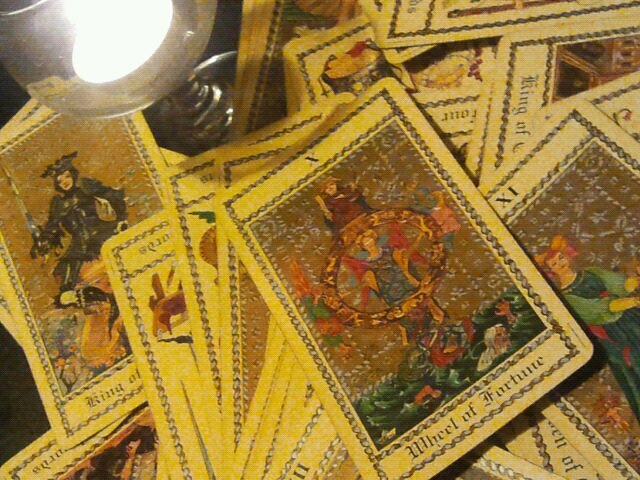 Please send any questions that you may have to readings@enchantedsaint.com There are special rates for Tarot Parties and public appearances within the RI and South Eastern MA area. Further locations may include travel expenses. Dream Analysis and Interpretation: Dream analysis and interpretation has a history since the earliest recorded civilizations. In every village of every culture there was a dream interpreter. And always held in high regard by every King, Queen and Elder to help them discern the guidance of their higher selves. So you may not be the King or Queen of your village, but understanding the guidance of your higher self is just as valuable and just as confusing to your conscious mind. Your consciousness does not shut off when you sleep, it just switches to the visual language of your subconscious. Your subconscious is connected and part of the collective consciousness and expresses itself metaphorically through symbols. Ronda understands the symbolic nature of the subconscious. She has been doing dream work since she was a very young child. This was due in part to her own intense dream visions and understanding them intuitively and leading to her life long independent study of Jungian Psychology.